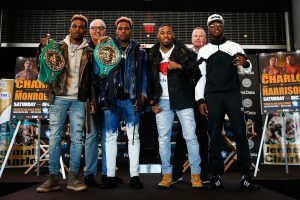 – Twin brothers and world champions Jermall Charlo and Jermell Charlo took part in a press conference in Brooklyn Thursday to announce their fights that kick off a new season of Premier Boxing Champions on FOX and FOX Deportes live in primetime on Saturday, December 22 at Barclays Center, the home of BROOKLYN BOXING™. With twin titans entering the ring in back-to-back fights, a coin toss was conducted at the press conference by legendary heavyweight Gerry Cooney to decide who would be the main event. With a call of heads on the WBC commemorative coin, Jermall won the right to enter the ring last on fight night as he takes on Willie Monroe Jr., while Jermell will battle Tony Harrison. The PBC on FOX and FOX Deportes broadcast will begin at 8 p.m. ET/5 p.m. PT. Tickets for the show, which is being promoted by Lions Only Promotions and TGB Promotions in association with DiBella Entertainment, go on sale Friday, October 26 at 10 a.m. ET. Tickets can be purchased at ticketmaster.com, barclayscenter.com, or by calling 800-745-3000. Tickets can also be purchased at the American Express Box Office at Barclays Center starting Saturday, October 27 at noon ET. Group discounts are available by calling 844-BKLYN-GP. “I got a good chance to see Monroe up close when I commentated his last fight. He looked good and I knew this was a possibility. I’m excited that it’s here and I have someone to perform against. “Monroe has tested himself against some of the best fighters in the world and that motivates me even more. He’s faced the fighters that I want to get in there with, so I see this as an opportunity to measure myself against their performances. “This is our first show with Lions Only Promotions for me and my brother and we’re really excited to have the opportunity. We’ve worked hard to get this thing going and we’re ready to show everyone all we can do. “We always dreamed of fighting on the same card like this with each other. We love winning together. It’s been like this all of our lives and it’s another chance for us to show-off together on December 22. “I’m glad that Jermall took this fight. He was commentating my last fight and I knew then that this was a fight I definitely wanted a lot. I’m going to take the most of it and leave no doubt that I deserved this chance in the first place. “My team has really stuck through with me and now I’m at such an exciting time in my career. I know that I have the tools to get the job done on December 22. It’s my second time fighting at Barclays Center and I know none of the bright lights are going to affect me. “Tony Harrison is a great fighter and I’m happy to be up against him. There are a lot of great fighters in this division and he’s another quality one. He’s dropped 21 fighters, so we know he has power. I feel like I’ve faced the much tougher competition and I’m going to show it on December 22. “I love Brooklyn and I’m excited to be on the first PBC on FOX show of this new deal. You can forget the critics because this is going to be a great fight. Me and Tony Harrison are coming to fight. It’s going to be two strong explosive guys leaving it all out there. “It’s great to have our own Charlos card. We’ve already been in training camp working hard for this one. Now we’re going to lock in even more and I know we’ll be at our best on fight night. “We’re driven by our legacy. Right now we’re going to keep increasing out levels in this sport. We know that the biggest fights are in our reach. We’ve always been competing against each other and trying to lift each other up. “I’m excited to be back here at this spot fighting at Barclays Center again. I’ve been so resilient in this sport. I haven’t talked my way into this fight. I have been ready for any fight offered to me and it was no different with this fight. “Sometimes there are things you have to do for yourself and this fight is one of them. In my heart I know I’m supposed to be here and I know what I’m capable of. Charlo is a true champion for taking this fight and he obviously has a great team around him. He applies pressure to himself to keep competing on this level each time and I respect that. “We’re both very competitive and that defines us as fighters, so I believe that’s going to add up to make this a truly explosive fight. I was honestly surprised that he took the fight, and I commend him as an athlete. He knows the danger in this fight that he’s taking. “It’s a pleasure to be here, especially with a great fighter like Jermall. I’m looking forward to fight night. Jermall trains so hard every day. He knows this is going to be a tough fight and he’s looking forward to the challenge. “This is going to be a great fight. We know who Tony Harrison is and what he’s about. He’s very tough and he comes to win. I thought he was up on the cards when he faced Jarrett Hurd and now he’s going to challenge Jermell, so we could start to have a chance to see how everyone stacks up at the top of this division. “I’m thankful to everyone for being here for this announcement of a sensational show that will take place here at Barclays Center. It’s an honor to be here to kick off this FOX series on December 22. “This is going to be another high quality card at Barclays Center. They were recently named PBC’s official East Coast venue and we’re thrilled to start that agreement with this fight. “FOX Sports is very excited to be kicking off their new partnership with PBC live on FOX and FOX Deportes beginning at 8 p.m. ET/5 p.m. PT with these exceptional fights. This is free TV on FOX and FOX Deportes and we’re excited to have these matchups step into the ring on December 22. “We’re truly honored and thrilled to host the first PBC on FOX event as part of this new partnership on December 22 in Brooklyn. We are the new mecca of boxing and I’m very proud of it. “Jermell and Jermall have both experienced incredible success in this building and I’m excited for them to co-headline this card. It will be historic for you and this building. We consider you members of the BROOKLYN BOXING family. I have a twin in the same industry as me, so I understand what it means to be recognized on the highest level with alongside your brother.